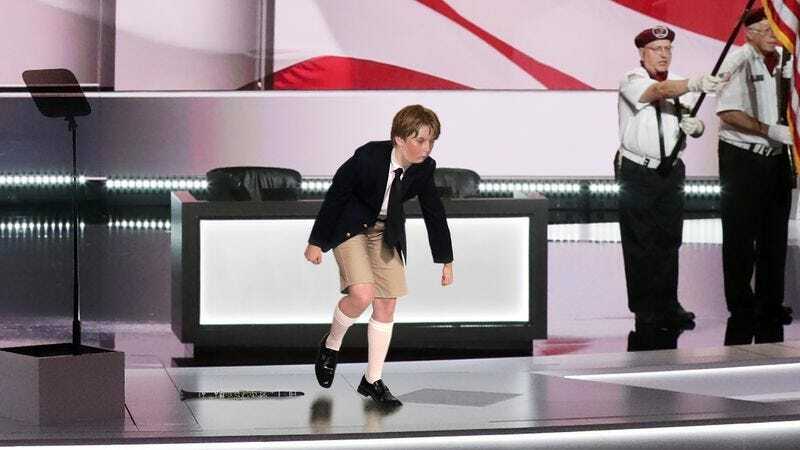 CLEVELAND—Unable to maintain control over his emotions after making the humiliating mistake, Barron Trump, the 10-year-old son of GOP presidential nominee Donald Trump, reportedly sprinted off the Republican National Convention stage in tears Thursday when he missed a note during his solo clarinet performance. “He turned as white as a sheet after he made a mistake during his rendition of ‘This Little Light Of Mine,’ and then his chin started to tremble, and the next thing you know, the poor kid is bawling his eyes out and scrambling as fast as he can off the dais,” said convention attendee Gilbert Relman, who noted how the instrument clattered loudly on the platform as the whimpering youngster dropped it from his hands before tripping over his own feet while fleeing to the wings of the stage, scuffing his shiny black patent leather shoes and ripping a hole in his pleated short pants. “The little guy really took it hard. You could still hear him crying all the way from backstage.” At press time, a furious Donald Trump was reportedly dragging the red-eyed, sniffing Barron by the ear to retrieve his clarinet in front of the crowded convention hall.